Even the wasps don't like Millwoods. Give winter a warm welcome from the patio! 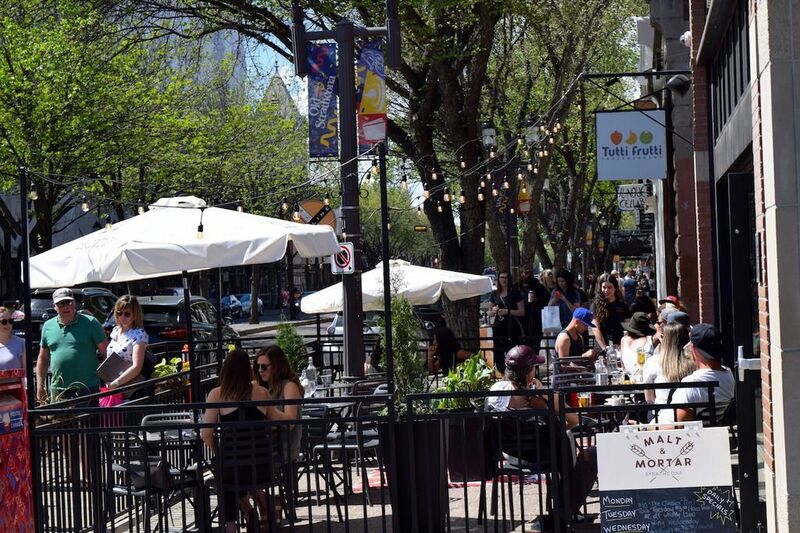 Winter Patio Kick-Off Weekend begins Friday, Dec. 1 and runs all weekend, giving Edmontonians plenty of opportunities to celebrate the beginning of winter patio season. 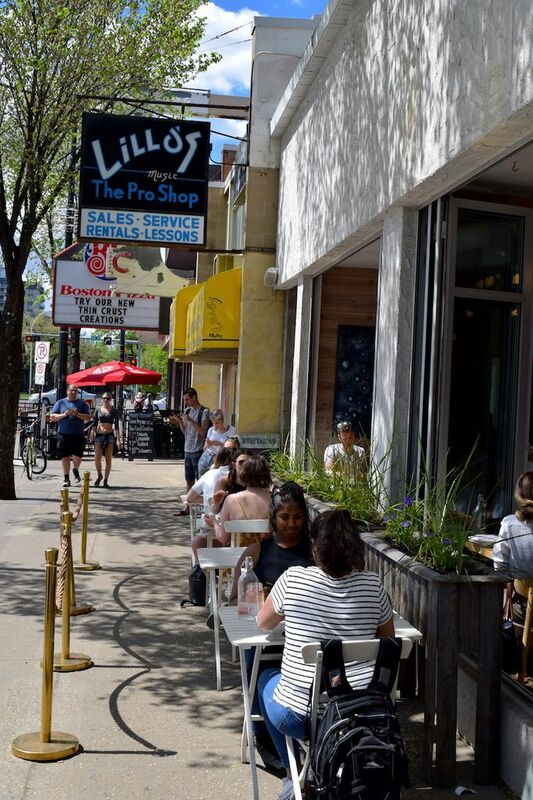 Participating establishments are taking their own unique spin on welcoming patrons to their patios, whether with late night drinks, sunshine brunches or cozy dinners. This year also features a “Play Street” on Saturday located just south of Rogers Place at 103 Street between 102 and 103 Avenues. The Winter Patio Kick-Off Weekend is organized by WinterCity Edmonton, an initiative that aims to promote and transform the way we live, work and play during the winter months, making Edmonton a more inviting and vibrant place for residents, businesses and visitors year-round. This event supports one of the strategy’s foundational goals by promoting and developing a four-season patio culture within the city. 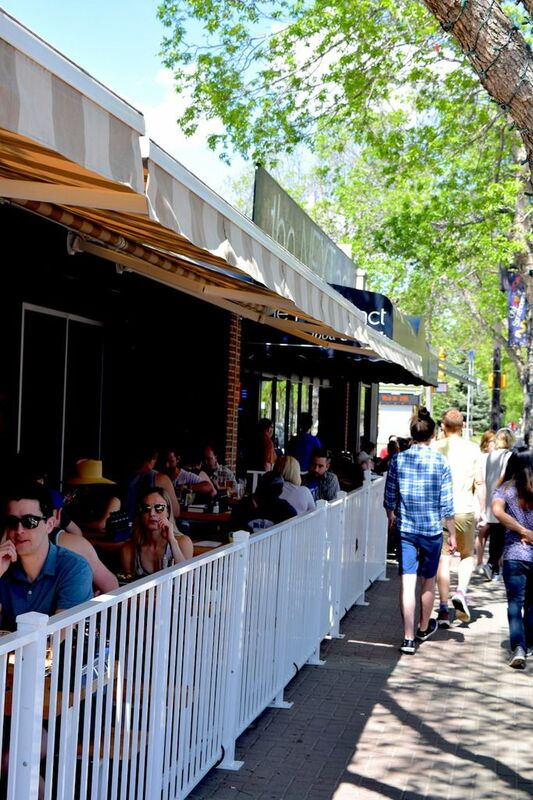 For a complete list of participating establishments, visit exploreedmonton.com/patioparty or call 311. Sherlock's and Rocky Mountain Ice House Patios open, Revel might be or will be tonight. Confirmed. Patio beer #1 of the year. Im shocked. With all the noise about patios you were making i figured that with the nice weather in january this would be at least your third or fourth. The Pint had a tent over their patio for Crashed Ice today. Mac had something going on, ticket event for their patio for Red Bull. I believe the Marriot did as well and with both having a long range view to the Course. This was patio temps. It was beautiful outside. Stated to be predicted high of 5C but felt like 10 in the sun. Pints outside, sure, but formal patio. Ever wanted to know 'how to' or what goes into obtaining a patio license... look no further! Yesterday at Rocky Mountain Ice House. I'm going to miss the 'double patio' the icehouse had with Vinyl the last couple of years..
Driving down Jasper Ave this evening, it looked like everything was packed to the gills. Bottega's got a patio out now. Sidewalk patios going up at Rocky Mountain Ice House and Cask! Booo! Today the Boston Pizza on Whyte installed their patio east of 109 st.
Expect delays on 82 ave. WB as the right hand turning lane to 109 is shortened. This will be all summer long for the most useless patio on the strip. I HATE that BPs patio. It's a no-parking spot due to traffic needing to turn right onto 109, and the patio is messing up traffic. I'm completely on board with the patios, but only if it's an actual parking space that's being used. ^ Like I said a couple weeks ago, that BP patio is useless. It is detached from the upstairs lounge therefore there is zero atmosphere. On week nights and weekends on my way home from work, that patio is empty. The most I ever seen is the odd table of two sitting at BP while other patios on Whyte are way busier. Yup, I've seen 4 people sitting at one table all the times I've gone past (which admittingly isn't usually during the busy patio time). It doesn't look like there are any people sitting there in Ian's photo. I saw that the other day, exciting! ^join me when it's done? They might have some swampwater of some sort. Bar Clementine currently has a patio under construction. Description:	To develop an outdoor patio (8.5m2 of outdoor Public space) in existing Restaurant (92.90m2 of inside Public Space). Station on Jasper has their patio coming soon. Nice to see the Station on Jasper patio now open! Last edited by IanO; 03-07-2018 at 01:29 PM. 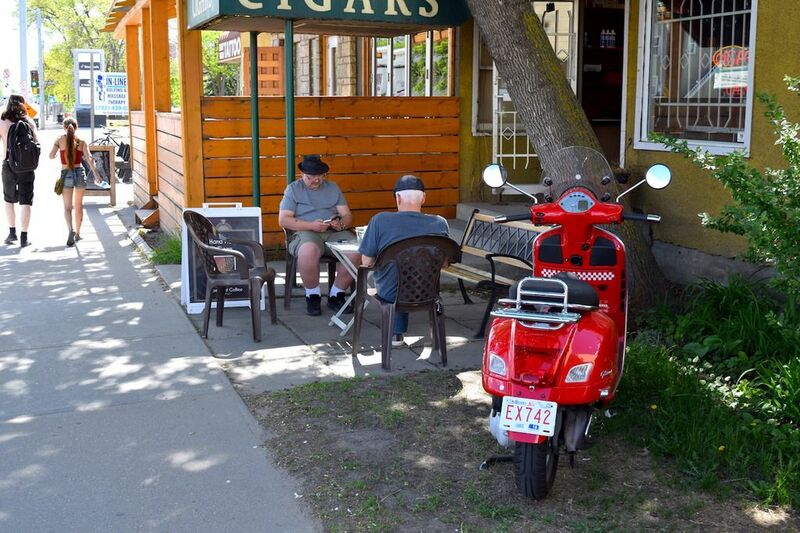 While travelling along the 105 avenue bike lane, I noticed the Dirtbag Cafe at 107 st had a nice little patio set up. I'm sure they'd love if a few Downtown residents headed there way, given MacEwan only has summer students now. If any of their customers or owners are on the board, I'd suggest to them they may want to sponsor Animethon, as that will be coming to MacEwan shortly. Die Pie patio is now up. Maisel Weisse and fries at one of my old haunts. In the old travel spot to the left of SugarBowl, a new offering from the same group... a boulangerie + other I believe. Maisel Weisse and fries at one of my old haunts. Once a cornholio, always a cornholio. Our patio contest is now open, please visit/vote. They are planning one, but have to work with heritage to sort out their front first. Cavern is still one of my favourite 'hidden gems'. "Best Patio for People Watching" category was totally fixed. Who are you interested in watching? If you're sincerely interested in watching Edmontonians in their natural habitat than Baba Fink's is the winner by a country mile. I understand though, as with all things DBA, these are of course aspirational categories - "One day, maybe, if we're really good, someone might pay attention to us and we'll be recognized for our interactive, street-oriented, urbanity." As a regular at Sherlocks myself, it is an excellent people watching spot. I like that patio because you're not on the side of a busy thoroughfare. Sherlock is a good place if you want to people watch the pokemon players taking down a raid. The patio at Boston Pizza Whyte ave. was dismantled this weekend. Bye bye useless patio! Patio time! ~#86 for the year. I'd say its the patio for the Cask and Barrel. You can see the former Sobey's space, and the entrance to the 104st Shopper's Drug Mart. Cask & Barrel for sure, yes. +/- 2, but often I will hit two in a day, sometimes three to get in the 100 on really nice days. Coffee in the morning counts. You did say "Day" in that post. "Patio time" like in previous posts wouldn't have been misleading. 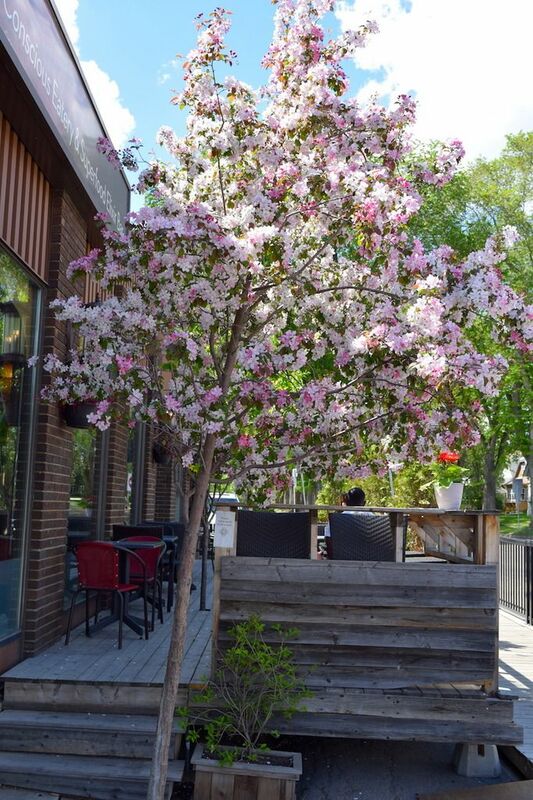 Description: To construct exterior alterations to an existing Bars and Neighbourhood Pub (reconstructing the outdoor patio, 216 sq.m of Outdoor Public Space and remove four parking stalls) (Canadian Brewhouse). -11 feels like -18, but the Polar Patio Club is just warming up. Do you always go to the same two patios? yesterday was hardly the day for enjoyable patio weather. I want IanO to continue to eat and drink on patios every day through the winter and complain when restaurants don't have theirs open when it's below -20. Embracing Nordic culture. Love it. ^^^It was enjoyable, not for 2hrs, but we were out for 40mins or so. Guessing about 80-90% of "Nordic culture" lives by an ocean with far, far more moderate winter weather than Edmonton. I'd go with earlier opening and later closing - but patios in Jan / Feb are a dozen fanatics and a million skeptics. ...patio party today with the Polar Patio Club at The Cask, 5pm. You're probably one of the few people who've kept this open. First 'how to microbrew' and now 'how to patio'... I HEART COE. Rocky Mountain, Cask, Sherlocks all looking open today or near open. Last edited by IanO; 15-03-2019 at 12:46 PM. Oh how do I love me some Sugarbowl patio. Patios at Brewsters and the Canadian Brewhouse on 104 ave and downtown Sherlock Holmes are open. Cask, Rocky Mountain, Station among others. State & Main's patio is open though nobody was using it. Drove by the Pint and Hudson's on 109th on Friday afternoon. Pint's patio was in full swing and absolutely packed with people enjoying the afternoon sun. Hudson's was not set up and looked like a ghost town. I realize theirs is a bit more covered and doesn't get the same sunshine, but man, talk about leaving money on the table.